Sambar deer—preferred by tigers | Where to next? Sambar deer may have an acute sense of smell and ears like satellite dishes, but these don’t always keep them from being a tiger’s first menu choice. This species of deer often signs its own death sentence. Unlike the spotted deer, which shouts out a quick alarm and flees at the first sign of a predator, the sambar stands and watches, giving alarm calls until the danger passes. It’s that failure to run that makes the sambar so desirable to the tiger—and such an easy target. 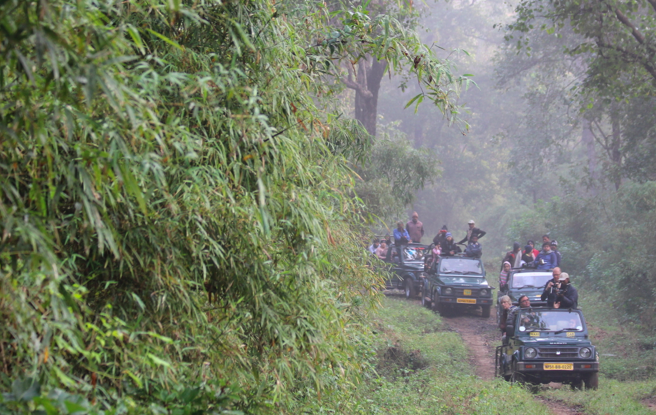 Everyone on a safari drive listens intently for a sambar deer’s alarm call. Repeated calls are a sure sign that a tiger, or other predator, is about, and all the Gypsies (4WDs) in a park will race toward the sound in the hopes of a spotting a tiger. 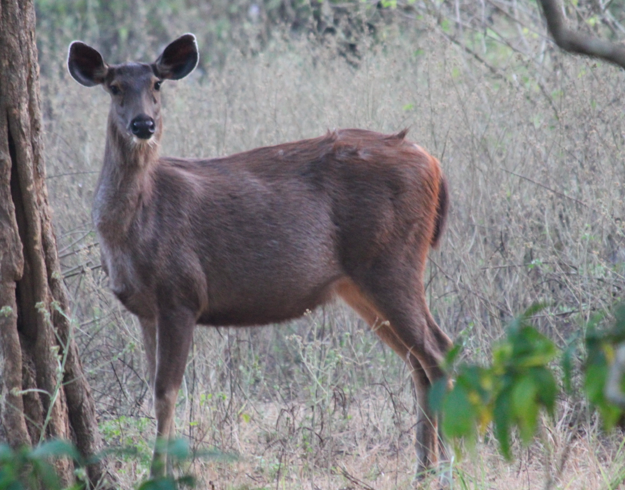 Apparently dholes (wild dogs) and leopards aren’t all that interested in sambar, unless the deer is young or injured. 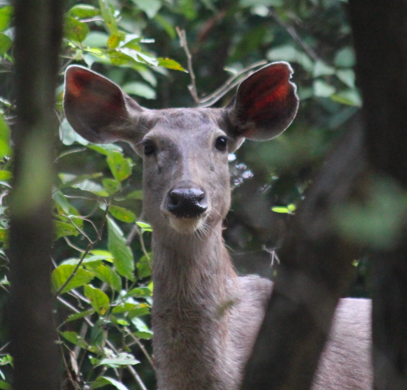 With the sambar being so popular with tigers, it’s lucky the deer is large and their population is healthy. Sambar deer are not endangered. In fact, they are the most widely spread deer species in the world, occurring in most Asian countries. We saw them in every national park we visited, and often standing along the roadside outside parks. They prefer to live in woodlands near water and, depending on the local habitat, will munch their way through grasses, fruit, shrubs, trees and water plants. Adult males can measure up to 1.5 metres in height at the shoulder and can weigh up to 350 kilograms. Some have even reached 550 kilos. Of the cervid species, only the moose and the elk grow larger. It takes a tiger four days to polish off a large male sambar. The gypsies rush to follow a sambar alarm. We did see a tiger here—but only a glimpse through the brush. 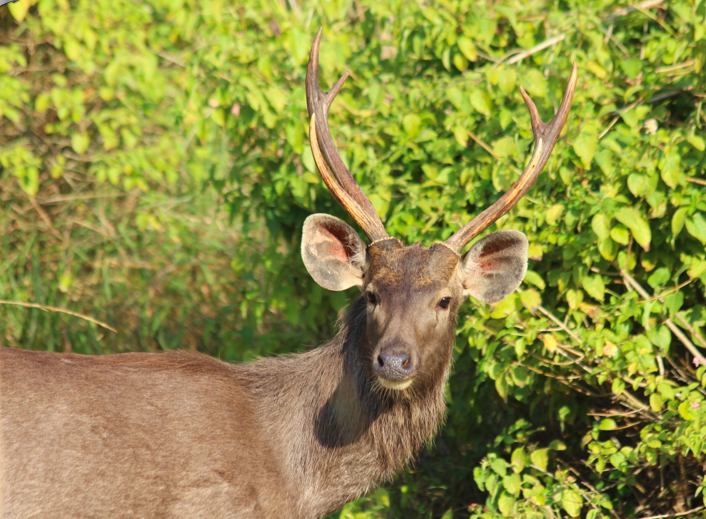 As with all deer, sambar lose their antlers every year. In case you didn’t know, that’s one of the main differences between deer and antelope—deer lose their antlers annually and antelope don’t. The breeding season is during November and December, but we saw plenty of young, which indicates breeding may go on for a lot of the year. Gestation is six months, so maybe the little ones we saw were only six months old. Assuming a tiger doesn’t get one, a sambar can live 16 to 20 years. Males tend to be solitary except during the rutting season. Surprise! And females live in small herds. I love the sambar. They look so gentle and exude so much dignity. Will he/she grow into their ears? Peggy, like most of the animals you’ve shown us these too are beautiful. What a shame they don’t have a better instinct for self preservation. And thank you, as always, for the beautiful photos. Looking forward to catching up in person really soon. Have a safe trip home. There are way more sambar deers than tigers, so I think they’ll survive just fine. Hi Peggy, the other comments have disappeared. I like reading other people’s comments about your travels so is this something I can fix myself? Not sure what you mean about the comments disappearing. I can see them. I think the comments appear at the bottom of each blog post, or there is a number indicating how many comments there are. If you are seeing that, try clicking on the number. If that doesn’t work, I’ll have to look into it when I get home. Beautiful animals! So cool to learn more about them through you. They may be foolish, but they are beautiful. And they look so gentle and peaceful. Pench National Park—tops the list as our favourite | Where to next?